Over the years, I have spoken to groups of managers, entrepreneurs and business students from abroad from America, Sweden, Finland, Singapore, China and elsewhere – who come to Israel to learn the secret of Israel’s incredible inventiveness. They know Israelis invented mobile and multi-core microprocessors, Copaxone, drip irrigation, cherry tomatoes, Aziltec, a key data-compression method, USB flash drives, Interferon, one of the earliest cell phones, a tiny video camera you swallow that checks your intestines, solar water heaters… and that list is not even a forshpeiz (appetizer). They want to know, how come? Although I have researched innovation for many years, I always struggle to provide a good answer. There are no laws of innovation that Israelis follow, I explain. Innovation is best defined as intelligently breaking the rules, something Israelis do with gusto. The rule is, break the rules. In future, I will respond differently. I will tell future groups an improbable but completely true story about how a talented, entrepreneurial group of people took over a run-down Kibbutz factory that made fire extinguishers, in the remote northern tip of Israel. Against all odds, in only five years, they turned the factory into a world leader in fire-dousing technology that has already saved many soldiers’ lives and prevented horrible burns. In the process, they earned export dollars for Israel and made 600 Kibbutz members exceedingly wealthy. This story captures the essential elements of what makes Israelis innovative and entrepreneurial – the Shoah, army, war, hutzpah, invention born of desperation. This story could have happened only in Israel. It captures the inner secrets of Israeli innovation. It has already been used by Technion’s Knowledge Center for Innovation to inspire other managers who run low-tech plants. 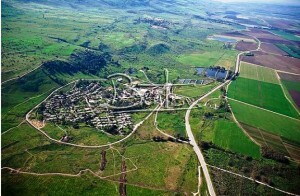 Kibbutz Lehavot HaBashan (‘the Flames of Bashan’) is located 10 kms. (6 miles) south of Kiryat Shmoneh, nestled below the Golan Heights just west of the Jordan River. It was started by a group of pioneers from HaShomer HaTzair, a Socialist-Zionist youth group, bolstered by Youth Aliyah immigrants from Poland and Germany who came together in 1945 to launch a new Kibbutz and settled on the present site in 1947. The name comes from “Lehavot”, the title of a Polish book that enflamed their imaginations, and Bashan, the Biblical name for the lush fertile land west of the Jordan. The kibbutz fought off Syrian attacks in the 1948 war, was plastered in 1958 by 300 Syrian artillery shells that caused death and destruction, and was threatened repeatedly by Hezbollah rockets since the 1980’s, culminating in the Second Lebanon War barrage in 2006. Over 40 years ago, the Kibbutz sought to diversify its agricultural revenue by starting a factory. They decided to make fire extinguishers, perhaps inspired by the kibbutz’s name. For years, red Lehavot extinguishers had a near-monopoly in the closed Israeli market and the plant thrived. But in the 1990’s, import tariffs were sharply cut and cheap imported extinguishers flooded in. The factory drowned in red ink, as losses mounted. Key managers left. Credit dried up, as banks stopped lending. Lehavot’s prospects were dismal and its workers were demoralized. In August 2005, Aharon Shita showed up. A graduate of Ben Gurion University in electrical engineering, he served in the career army (Signal Corps lieutenant colonel), then became a senior executive at Bezeq phone company, Nortel and Clal Technologies. He was asked to become CEO of Lehavot (later known as LVT), and he agreed, partly because one of his children had moved to the North. The first thing he did was to buy paint and paint brushes. He and the workers painted the place white. It was a signal that major change was about to take place. Then, after whitewashing the past, he tackled the future. “Without vision,” the prophet Isaiah said, “the nation disintegrates”. CEO Shita created a vision to drive Lehavot forward. He intuitively understood what management guru Jim Collins, author of Good to Best, calls BHAG’s – Big Hairy Audacious Goals. Our vision, Shita decided, is to become “a leading producer at the cutting edge of technology”. Say again? An old decrepit plant on a remote kibbutz, without money, management or technology, far from export markets? The “cutting edge of technology”? Hutzpah! Fantasy! Collins says a strong vision should arouse laughter. I am certain Shita’s vision did. But he convinced his Board of Directors to support him. Next he shut down a business that was unprofitable – refurbishing old fire extinguishers for the Israeli Army. This involved a few layoffs, not easy for a left-wing kibbutz to accept (its members, essentially, were Shita’s Board of Directors). Shita understood that in order to create new things, you have to shut down old ones. But the really tough part lay ahead. He made the obligatory pilgrimage to the banks in Tel Aviv to borrow money. They threw him out. But slowly, things began to turn around. In 2006 Lehavot developed a system for putting out fires in cell phone antennas, vulnerable to vandalism. Cash flow turned positive. However, the Israeli market was limited. Shita and his team decided they had to aim for exports to foreign markets. Shita’s idea team was led by Ilan Elhalal, veteran kibbutz member and a worker at the Lehavot plant since the 1980’s. Elhalal assembled a handful of talented engineers, many of them veterans of elite commando units. The team developed a revolutionary new product known as Zone 5 – rapid automatic fire suppression in wheeled armored vehicles of the kind used by U.S. Infantry and Marines in Iraq and Afghanistan. Loaded with gasoline and ammunition, these vehicles are vulnerable to fire, easily started by rifle-propelled grenades, improvised explosive devices or even light arms fire. Why Zone 5? Because the system, unlike that of competitors, doused fires in all five sensitive points of military vehicles, including the rubber tires (devilishly hard to extinguish), engine, and interior. Shita knew instinctively that only a comprehensive fire-suppression system would be competitive. Lehavot’s neighbor is Kibbutz Sasa, home of Plasan, world leader in ballistic armor for military vehicles. [See “The Little Kibbutz That Could”, The Report, Sept. 29/2009]. Plasan’s CEO Dani Ziv asked Shita if he could supply on very short notice Zone 5 fire suppression systems for Plasan demonstration vehicles to be sent to the crucial upcoming Army-USA trade fair exhibition in Washington, D.C. Shita’s team pulled together, worked day and night and made the deadline. Zone 5 was a huge hit. Orders poured in. And that led to a major crisis. Aharon’s father lived through the Holocaust as a teenager, coming to Israel at age 18. Aharon himself was born when his father was only 20 years old, not long after his father’s wrenching Shoah ordeal, recounted to him in full. He told me that his father’s Shoah experience has powerfully influenced his life. “No matter how tough things were for me,” he said, “I always told myself, look, this is nothing compared to what my father went through”. “Nothing destroys an organization faster than a charismatic leader,” Jim Collins once wrote. I asked Shita whether he had charisma. In response, he told me about an episode when he was in the officer’s training course. “What is the key element of leadership?” he and a group of officer candidates were asked. “Charisma!” they said. “Courage. Boldness. Follow me!” Aharon was last. “What’s your take on leadership?” they asked. “Above all,” he said, “be a ben-adam” (a good person, or mentsch). He recounted the time, after the First Lebanon War nearly thirty years ago, when he was sent to take command of a run-down army outpost in Lebanon, near Bhamdoun, a town on the Beirut-Damascus road. He found a filthy place with no water, power or sanitation and below-zero morale. First he assembled some C-rations and had everyone help clean up the kitchen and sit down to a meal. Then at night, he crawled to the broken generator, wrote down the service phone number painted on it and dialed it. With instructions given over the phone, he soon had the generator working and power was restored. That experience served him well when he first came to Lehavot. What does the future hold? LVT continues to come up with pioneering inventions. For example, take the one developed by R&D engineer Carlos Feller, who came to Israel as a youth from Argentina. The US Army wanted LVT’s fire extinguishers to be hardened, encased in armor, so they would not explode and wound soldiers if hit by shrapnel or a bullet. Such ‘armor’ adds unacceptable weight and cost. Carlos found a solution. He once observed soldiers wearing ceramic flak jackets. “Okay,” he said, “let’s put little flak jackets on our extinguishers.” This idea, now patented, is light, effective, cheap and is another winning product for LVT. It is the kind of innovations Israelis are good at. Slipping flak jackets on fire extinguishers is truly out-of-the-box thinking. During our visit to LVT, we saw an amazing new device that detects fire within 100 milliseconds and douses it with a spray of nitrogen. Had Gilad Shalit’s tank been equipped with it, Shita explained, it could have prevented Hamas from taking him prisoner. In 2006, Hamas terrorists emerged from a tunnel near Gaza and attacked Shalit’s tank with an anti-tank missile. The tank’s fire-suppression system put out the resulting fire, but sprayed the interior of the tank with toxic Halon gas. Shalit and his crew had to leap out of the tank. As a result, two were killed and Shalit himself was wounded and captured. One crewman who remained inside was saved. LVT’s new system, in contrast, is non-toxic and the tank crew need not leave it when the fire suppression system activates. Recently, cautious kibbutz members debated whether to install a new swimming pool. They consulted with CEO Shita. Yes, he reassured them, you can definitely afford to put in a swimming pool. “Their pensions are guaranteed,” he told me. The author is senior research fellow at the S. Neaman Institute, Technion. We would like to issue a special credit to the Jerusalem Report.